Family detached villa 200mts from the beach. 3 bedrooms, sleeps 6, 2 complete bathrooms, 1 toilet. Heating, air-conditioning in ALL bedrooms and living room, Full outdoor Barbecue, Satellite TV with Sky News + some entertainment channels. Barbecue. Internet wi-fi. 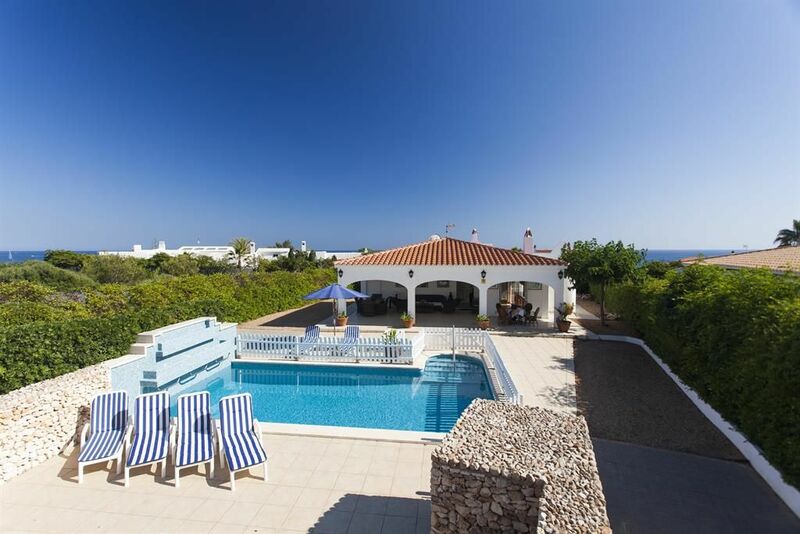 The villa is built all in one level, which allows easy access for young and old alike making it ideal for holidays. Private 8 meter pool with roman steps, large private outdoor private space, spacious sunny terraces and attractive covered terrace overlooking pool with outside furniture. Parking. Total security and privacy: is completely enclosed by a wall. Very private with security for children. Fully fitted kitchen, completely equipped: dishwasher, washing machine, 2 big fridges, 1 new freezer, microwave and oven. Laundry room inside patio. Access to the pool terrace. Fully equipped, blankets, sheets and towels. Air-conditioning in all rooms and ventilators in all bedrooms too. Cot and high chair is optional. Fully equipped, beach towels, Beach at 200 meters and shop at 200 meters. A 25% payment is to be paid at the time of booking, the oustanding balance is due 1 month prior to arrival. Cot & High Chair available upon request. Fridays changeover day. Arrival after 14pm. Departure prior 10am. This is my parents property. I have been managing it for the past couple of years and is a pleasure doing so. Thank you for your interest, we look forward to your visit! This property is unique. So close to the beach (200 meters away!) really nice private swimming pool, all bedrooms have air-con including the living room! We have a new barbecue set for you to enjoy next to the pool. Very private and wonderful for families! 3 bathrooms: 1 en-suite complete bathroom. 1 complete bathroom. 1 toilet. Very spacious lounge and dining room. TV satellite dish. Lots of natural light. Fully fitted kitchen. Very well furnished with microwave, washing machine, dishwasher, 2 big fridges, 1 big freezer, oven. 40 minutes drive from Golf Club Son Parc. Notes on accommodation: Air conditioning. Heating. Located in a residential area. Outside: Private 8 metre pool with waterfall and roman steps. Private garden, attractive covered terrace overlooking the pool. Parking. Completely enclosed by a wall. The house is reached by a short drive and taking pride of place to the front of the property is the pool. Surrounding the pool are spacious sun terraces WITH BRAND NEW BARBECUE, whih are well furnished for living and dining outdoors, a shower and brick built barbeque. Utility Room: Laundry room inside patio. Cleaning / Towels / Linen / Maid service: It is cleaned at the beginning and end of each let, but not during your stay. Other: 2 double bedrooms have air-conditioning and all of bedrooms have excellent quality ceiling ventilators. Loved it, everything we needed, masses of room for everyone, very peaceful. So much outdoor space, was spoiled for choice where to sit for dinner! We stayed at the villa with our two children under 5. It is the perfect villa for couples or families. It's completely secure and private so the children could play outside while we prepared breakfast etc in the kitchen. There is AC in all bedrooms and the lounge. The pool is wonderful. It's the perfect location for the beach and restaurants etc. Paco looks after the villa and checks on on you to make sure everything is ok and even came on our penultimate day to make sure we were ok and to ask how our stay had been. We would love to return. My name is Sarah Cunningham and I am a school teacher in London. My family and I have been all over Spain but never felt satisfied of what we found. That is until we arrived to this property in Menorca. I am not in the custom of filling out a review of a property after I have been on vacation but this time I simply had to. I felt I needed to share with everyone what a great time we have had in this wonderful property. My husband and I are already looking dates to come back. Everything was perfect. The property was clean and tidy, the owners very friendly and helpful and I recommend anyone to stay in this property! Wonderful Property! I recommend everyone to come! Great Property! I had a great time! Was the listing description accurate regarding the location, layout, facilities, etc? Was the property clean, was it well-maintained? THERE ARE SEVERAL RESTAURANTES NEAR BY, THE BEACH BAR, EL BUCANERO WAS OUR FAVOURITE SPOT. A BAR RIGHT ON THE BEACH AND JUST 1 MINUTE WALK FOR THE HOME! AMAZING! We had a lovely week's stay at La Florida, very relaxing in the very private gardens. It's a great location for Binibeca with restaurants/bars left towards Binibeca Vell or right down the hill towards Cala Torret. The beach is also only about 100m away if you want to spend the day there. With a supermarket just up the road it was easy to be flexible on eating whether it was BBQ lunch or snacks out. The house was perfectly comfortable and well stocked with crockery and glasses which meant we could load up the dishwasher! Outdoor was clean and tidy with plenty of space to sit and good number of sunbeds. The pool was a great size for dipping and cooling off and very clean. Only possible niggles were the lack of TV programs, other than news channels, in the living room and no hot water in the kitchen, but nothing serious. We had a had a great stay ! Horses courses: 10 minutes drive. Tennis, Paddle and Diving: 15 minutes by car. 2 minutes walking to sandy beach Binibeca Beach. The famous beach of Binibeca with its unusual beach bar. 15 minutes drive to: Airport, Port, Hospital, Medical assistance. Car hire can be arranged. 2 mins walking to the Bus service to and from Mahon. 10 mins drive San Luis Town. 15 mins drive to Mahon. 1/4 mile to Binibeca Vell. 2 minutes walking to the nearest supermarket, bars and restaurants. Whilst the supermarket, restaurants, several bars, pubs and shops can be easily reached in 3 minutes by car.